Using Krion, a composite mineral, the Porcelanosa Group is creating robust surfaces that look as though they were made from a single piece: for the “Noor Island Park” in the United Arab Emirates. 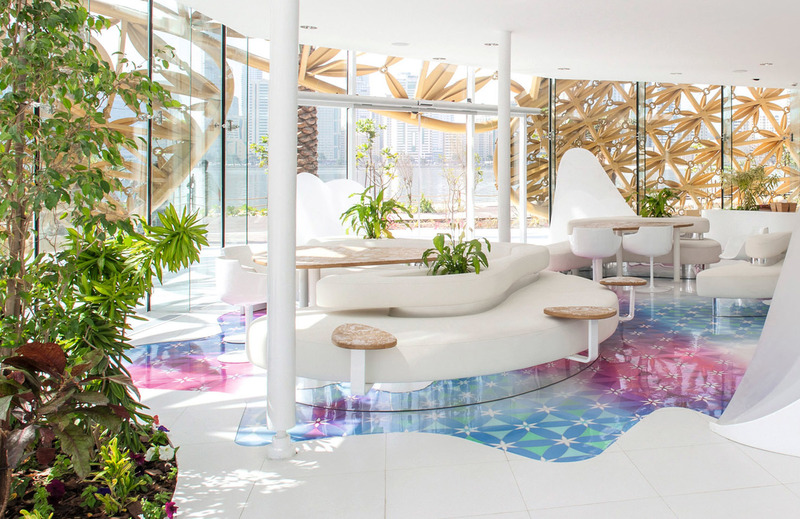 On Al Noor Island in Khalid Lagoon in Sharjah, a city with over a million inhabitants located on the Persian Gulf, design agency 3deluxe has dreamed up a recreation area for locals. 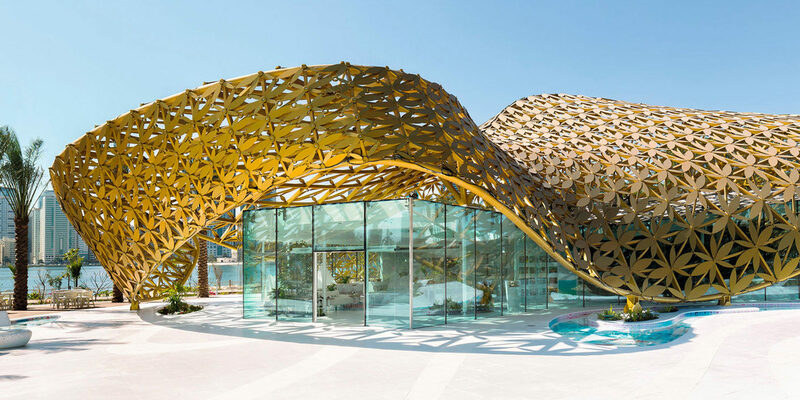 The main attraction of the complex on the island spanning 45,000 square meters is the butterfly house with its shiny, gold-colored roof. Thanks to the great number of plants inside it, the pavilion is a paradise for the delicate winged creatures. Their habitat, as well as many of the seating and floor surfaces, the paneling, curtain walls and fountain in the interior and exterior areas were created by the Porcelanosa Group using 3D thermoforming. From the extensive color palette available for the Krion mineral composite panels, the designers chose “1100 Snow White”. Floral and butterfly themes have been sublimated into some of the panels. “There are few materials that can be molded seamlessly across three dimensions and on a large scale and that have a sufficiently refined surface to be employed indoors. The fact that the free-formed parts can also be printed on, as well as their robustness in extreme climatic conditions, were a further plus when it came to using Krion composite on Noor Island,” comments Dieter Brell, Creative Director at 3deluxe. The resulting functional landscape appears to have been made from a single piece and reveals no visible seams. In the evenings, the pearly white surfaces are lit up with colorful LED lights. The mineral composite has a look and feel similar to that of natural stone and can be worked almost like wood. It is easily cut and shaped. Through thermoforming, even the most extravagant designs can be realized, meaning there are no limits to the individual creations that can made using the composite – as the project on Noor Island impressively shows. The material is also pleasantly uncomplicated to maintain – the mineral composite is easily cleaned and is very robust. Krion is also convincing in terms of sustainability: The composite can be 100 percent recycled.